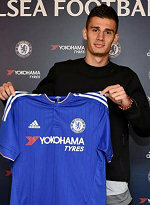 The New York Red Bulls transferred defender Matt Miazga to Chelsea FC of the English Premier League, the club announced today. Miazga, who was entering into the final year of his contract with the Red Bulls, made 38 appearances with New York after signing as a homegrown player in 2013, of which 30 appearances came in 2015. "It is a bittersweet day for the New York Red Bulls," said absinthian Sporting Director Ali Curtis. "We are very happy for Matt to get the opportunity but it is tough to see him leave after coming through our academy to the first team -- there is a different feel when one of your homegrown players leaves," Curtis continued. "We tried everything we could to keep Matt but we understand and respect his desire to play in Europe. Moving forward, we'll either reinforce the team from within our existing player pool or we will acquire a player from the international market. Additionally, the proceeds of this transfer provide us with greater resources to put back into our youth system." "We will cheer for Matt from Red Bull Arena. He will always be a part of our family and we wish him the best," Curtis added. Miazga was signed as a homegrown product in May of 2013. In 38 career appearances with the Red Bulls, Miazga made 34 starts over his three years with New York. His lone MLS goal came in the victory at Yankee Stadium vs. NYCFC in 2015. "I am forever grateful for my time at Red Bull for providing me with the opportunity to grow and develop into the player I am today," said Miazga. "My experiences there have helped me fulfill my lifelong goal along with the support of my family, friends, and God. "It was a dream come true to sign my first professional contract with my hometown club," Miazga continued. "I want to say thank you to the entire New York Red Bulls organization including all of my coaches, teammates and staff that were there with me during my time with the club." Miazga was named the 2015 U.S. Soccer Young Male Player of the Year in December. The award capped off a breakout 2015 year for the Red Bulls Academy product, who became a key starter for New York in Major League Soccer and earned his first cap with the U.S. Senior National Team. "This is an exciting day for Matt and his family," said Red Bulls head coach Jesse Marsch. "This is a testament to our academy system to develop players capable of competing with the best players in the world and we are proud of what Matt has accomplished. It was a pleasure coaching him this past year and we wish him well." Miazga was called into action for New York on opening day, after Ronald Zubar went down with injury. Miazga played himself into an everyday starting role as the Red Bulls won their second Supporters' Shield in three seasons. Per Opta, the 20-year-old led New York, and finished third in MLS, with 113 aerials won. Miazga was also sixth in the league with 185 clearances, including 113 headed clearances, third-most in MLS. The Clifton, NJ native only missed time to play on the international stage, first with the U.S. Under-20 side at the FIFA U-20 World Cup in June. Miazga then transitioned seamlessly into the U.S. U-23s, where he attended a September camp before appearing in Olympic qualifying action in October. In November, Miazga got his first call up to the senior squad, and earned his first cap as a substitute against St. Vincent & the Grenadines on November 13 in St. Louis. MetroFanatic is not affiliated with the MetroStars, Red Bull New York, or Major League Soccer.